We all understand it’s important to drink water. It’s been told to us our entire lives. Our bodies depend on it for a multitude of reasons to function properly. However, when related to riding a dual sport, why is staying hydrated important? Riding a motorcycle is a strenuous activity on the body, especially once you take it off the pavement. It takes a great amount of energy and muscle function to keep your bike moving across rough terrain. Even an “easy” ride can take a turn if you have to push your bike out of the hills when it breaks down, are repeatedly picking it up, or are exposed to hot weather and bombarded by the sun all day. How does water improve our riding, and also help prevent us from being miserable during? Our bodies use water to stay cool, transport nutrients and oxygen, and filter out used material. Your muscle function directly depends on all of these factors. Without proper hydration, how long you can continue strenuous activity diminishes. This takes away from your ride time when you become fatigued, overheated, get muscle stiffness, lose coordination and focus, and more. Have you ever fogged up your goggles and become disoriented after picking up your bike? It can be very discouraging to keep riding after repeating that situation, and turns a fun activity into a chore. In order to properly hydrate yourself, you need to plan ahead. Drink plenty of water way before your ride to make sure your body is ready to go before you even throw a leg over the bike. Don’t wait until you are already on the trail. Also, carry water with you to maintain your hydration throughout the entire ride. You lose water while riding, even on a cold day. In order to help your body retain the moisture, you will also need to supplement your water with electrolytes. Sodium, chloride, potassium, magnesium, and calcium enhance the function of hydration, and help your body hold onto it. Adding things such as bananas or electrolyte supplements is an easy way to maintain the proper amount in your body. Avoiding diuretics such as alcohol and caffeine will help tremendously as well. When you follow these guidelines, you’ll ride faster, longer, and enjoy the experience far more. Your body will be fully operational and ready to take on the adventure you are putting it through. There’s a multitude of solutions out there to bring water along with you on a ride. The most common is the hydration backpack, but other options exist such as keeping liquid in a tank bag or in your luggage. The latest version of the Nac Pak has quite a few upgrades over the previous. Much sturdier material, a new shape-shift Hydrapak reservoir, and a re-designed strap system. This bag feels extremely stable on your back and chest, and with the shape-shift function, the reservoir helps keep the liquid inside of it from all sitting at the bottom of the bag for maximum fit. I upgraded my personal Nac Pak with the Hydrapak Arctic Fusion tube to help keep the water sitting in the hose at the optimal temperature throughout the day. It’s never fun trying to drink out of when the water in the tube freezes or becomes extremely hot. A reservoir backpack is a great choice for those who prefer to carry water on their person, and can access it quickly moving on the bike or even once you have walked away from it. These bags also have great solutions for carrying extra gear, such as a PLB, camera, snacks, tools, and much more. This solution takes another direction with carrying water. Instead of carrying a large amount of water on your back (water weighs 8 lbs per gallon), the Nomad tank bag allows you to let the bike carry the weight for you. If you are on a long enough ride, your shoulders and back can easily become fatigued over time, even with a small amount of weight. 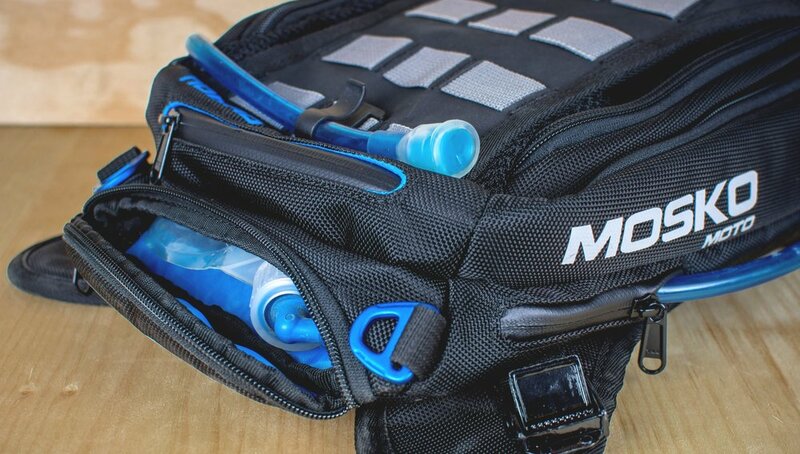 The hose from the Platypus reservoir is conveniently stored on the side or top of the tank bag, making it easy to use while riding, and even for filling up a cup at camp or rinsing of your toothbrush. Carrying water in your tank bag isn’t just an alternative, it also creates the option of carrying more water than your backpack can alone. We recommend saving this solution for motocamping trips or long adventure rides. If you are going to be riding aggressively off-road, keeping weight off of your bike will make a big difference in it’s handling characteristics. The size of the bag can also hinder your body movement on the bike by getting in the way of your knees and moving your weight forward over your tank. However, the coolest part of the Nomad is its ability to transform into a backpack, so you can shift its position throughout the day as the ride changes. This is one of my favorite pieces of gear now. The Reckless 10 is a spinoff of its larger rear-mounted rackless counterparts, the R40 and R80. 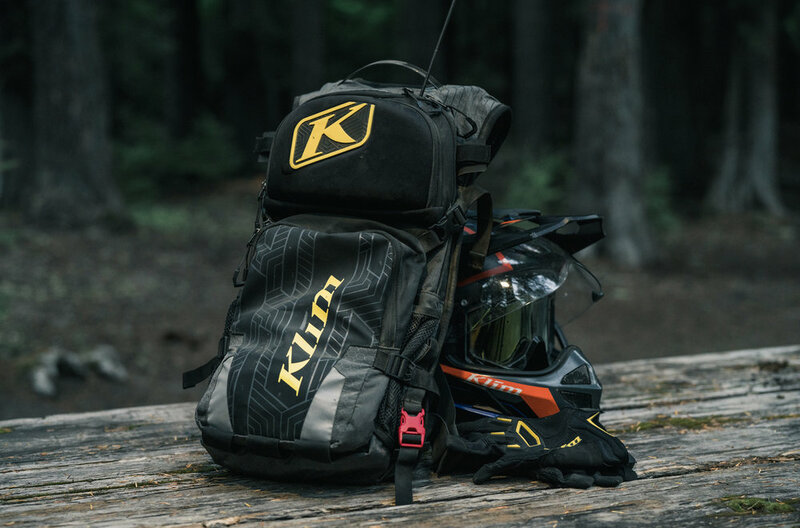 With its minimalist design, it makes it easy to carry just the essentials needed for a day ride, and also is small enough to not hinder your movement on the bike when riding off-road. Like the Nomad, this opens up the possibility of keeping weight off of your back, but allows for much more aggressive maneuvering than a tank bag can. Each side of the R10 has a holster, which can be loaded with water bottles or a large molle pouch with a reservoir inside. The weight also sits low and on the rear of the bike, allowing for the rear suspension to help compensate. It’s almost as if it’s not even there while throwing the bike around. Take care of yourself, and enjoy the ride even more.